If you are looking for a sea view apartment on the west coast of Phuket which is set in a very salubrious neighbourhood then I think we may have something special for you. 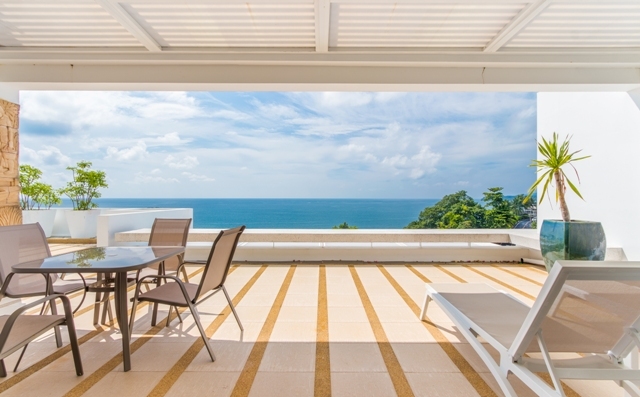 This gorgeous 3 bedroom sea view apartment overlooks the Andaman sea and enjoys the most stunning of sunsets. Large living areas, a fully equipped European kitchen, 3 spacious bedrooms and a large entertainment and sun terrace make up the floor space. The residence is tastefully furnished and decked-out. Due to the slopping and staggered design of the units above and below, privacy is ensured. Set on the crags of Millionaires Mile which wrap around the Kamala headland, this property is well positoned for a gentle stroll to the beach or into Kamala for a spot of dinner at any of the growing number of restaurants. The development itself benefits from 24 hr security, large private pool, gyn, sauna and on-site management team. Now at this stage I could drone on and on about walls and tiles and electric sockets, but I wont. If the sea views and sunsets dont interest you then I bet a bag full of conkers that tiles and "his ''n hers sinks" wont do it either. Maybe the best idea is to just view it and see if it "speaks to you". Go on, hit the enquire button, might turn out to be the best thing you''ve done all day.